Apart from being great at nipping through traffic, easy to park and even avoiding the London congestion charge, motorbikes are also great fun. Over the years, the sight of seeing someone jumping cars, buses, people and even canyons on a two wheels has thrilled crowds around the world – turning relatively unknown motorcycle enthusiasts into overnight superstars. Here’s a look at some of those brave men who have kept our hearts firmly in our mouths over the past 100 years. A young Gary Wells made his first jump at the tender age of 14 after starting out riding go-karts aged just 3. In 1980 he set his own world record with a jump of 176 feet 4 inches and from then never looked back – setting 110 world records and suffering just one accident. Wells left America and moved to Mexico in the 1990s, where he now guides select off-road riders through the virtual wilderness of the Sonoran coast. 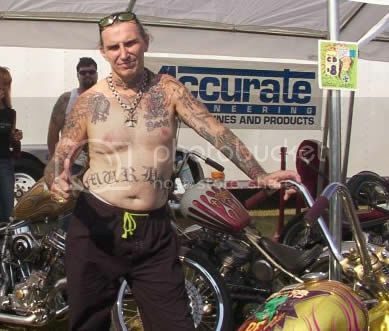 Lawrence DeSmedt was named “Indian Larry” due to the fact that he would ride around the streets of New York on a chopped Indian motorcycle, but it wasn’t until the last few years of his life that Larry became known for his two wheeled stunts. In his former years he was better known for building bikes and then for the artwork that he created around them. He died of injuries sustained in a motorcycle crash during a show in 2004. 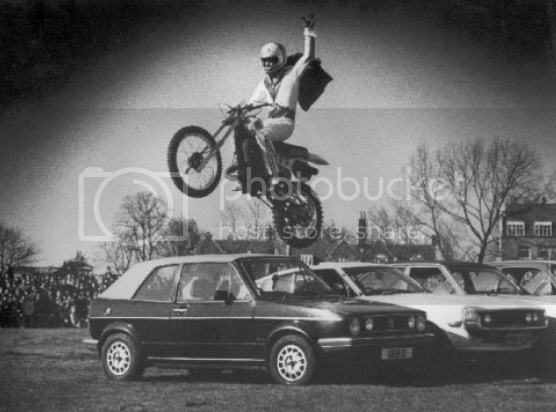 Better known by some as “The Wheelie King,” Domokos was at the peak of his fame in the 1980s and 90s, setting a then record for the longest continuous wheelie – an incredible 145 miles. The record stood for eight years before eventually being beaten. Doug was to eventually be killed, not in a motorcycle accident, but in an ultralight aircraft crash in 2000. He would later be inducted into the Motorcycle Museum Hall of Fame in Ohio, much to the delight of his many fans. It’s often said that Orren “Putt” Mossman was the most famous stunt motorcyclist of the first half of the 20th century. He would travel across America with a troop of fellow riders, putting on stunt shows to thousands of people at a time. He would later go on to perform in 45 countries on six continents. His popularity ensured him global fame and riches beyond his wildest dreams. Continuing to perform well into his 70s, Mossman died in 1994 at the age of 88 – not bad for someone in such a dangerous industry. 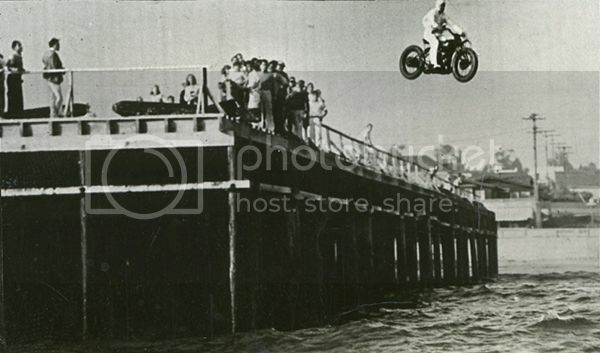 Heavily influenced by Evil Knievel, Frank Mackewich started riding motorcycles at the age of 14. 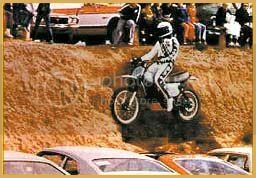 The New Mexico desert was perfect for a budding stunt rider to practice his moves and he soon picked up the name ‘The New Mexico Kid.’ Jumping cars and riding through fire was Frank’s speciality as he toured with the stunt group the Hurricane Hell Drivers. As well as his many death-defying stunts, Frank was just as famous for his crashes – saying he owed his life to his crash helmet when he quit stunt riding to become a New Mexico police officer. These days Hutch is better known for his appearance on the silver screen than in the saddle – probably due to the fact that being a stunt rider in the early 1900s didn’t guarantee much TV exposure. Born in 1879 Hutch was the subject of five Hollywood movies in the 1920s and gained notoriety for being the first man ever to jump a moving train on a motorcycle. When you grow up as the son of a world famous stunt rider you don’t have many choices when it comes to your future career plans. Born in 1962, the son of the legendary Robert “Evel” Knievel, Robbie was riding a bike by the age of 4 and at 8 he was appearing with his famous father at shows in Madison Square Garden. Robbie spent much of his career replicating his father’s more famous jumps, but still managed 350 jumps and 20 world records in his own right. Throughout the 1970s and 80s Eddie Kidd was one of the most famous men in Britain. Being thrust into the limelight for his ability to jump just about anything on a bike, Kidd was also a major player on the Hollywood stunt circuit – doubling for the likes of Roger Moore, Michael Caine and Harrison Ford. Branching into modelling and even pop music Kidd appeared to have it all, before a crash at an event in 1996 confined him to a wheelchair and years of rehabilitation in order to be able to walk again. During the 1970s Robert “Evel” Knievel was everywhere. His flamboyant white, red and blue jumpsuit could be seen jumping cars, buses, the Grand Canyon, just about anything that there was there to jump and usually in front of a live TV audience of millions. At London’s Wembley Stadium in May 1975, Knievel attempted to jump 13 buses in front of a crowd of 90,000 people, but he crashed on landing, breaking his pelvis. Refusing a stretcher Evel announced to the crowd that this would be his last attempt, before walking out of the arena – he soon changed his mind and would be back in action later that year. 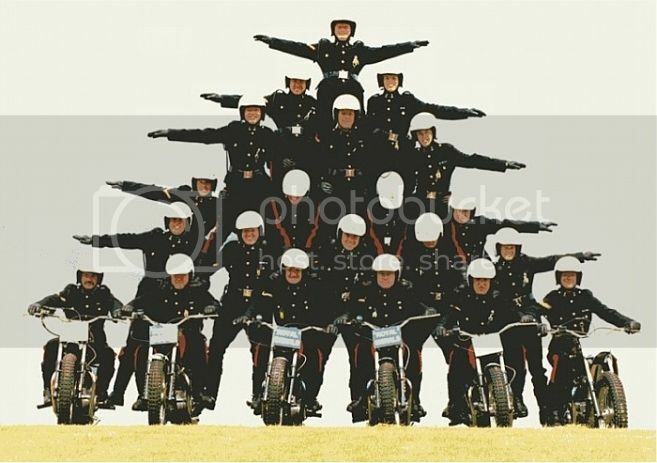 Dating back to 1927 “The White Helmets” can claim to be one of the first motorcycle display teams in the world. Consisting of serving soldiers from the Royal Signals, the team’s origins are firmly rooted in the days when they were deployed as despatch riders on horseback. Now a team of up to 30 riders can be seen performing stunts and acrobatic skills at events all over the world. Author Bio: Lucia regularly blogs for her website vespa.org.uk and is guest blogging on behalf of Davies & Co who specialise in bike accident claims in the UK. 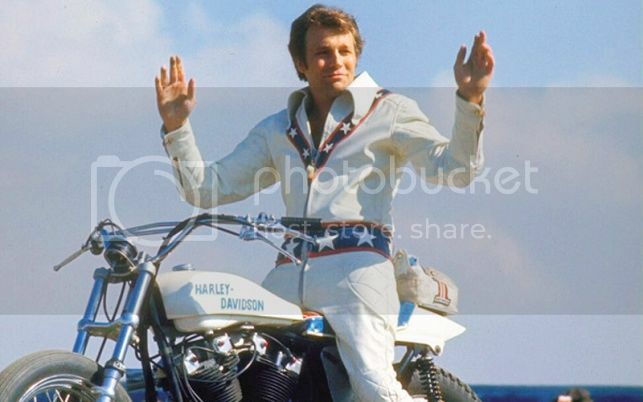 They don’t make them like Evel Knievel anymore! Nice article. Helmet Hair – Motorcycle Blog	Powered by WordPress 71 queries. 0.712 seconds.